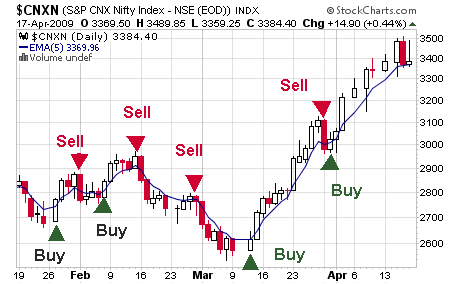 Chart shows Buy and Sell signals for the past 3 months. but currently,it is in the no trade zone,is it not,rajandran? how do i see 5EMA charts. how can you made this nifty chart with buy/sell signal? please give me some idea. just Go thro the AFL codes. Its very basic and simple code to understand how buy and sell signals are created. Is it necessary to buy Amibroker? Any possible bank nifty one minit chart for very low stop loss. Do we apply same 5D EMA rule to stocks as well? Is there any AFL code made by you? I am trying to prepare one as below but not able to include SL, TGTs. Requesting you to guide me for the same.